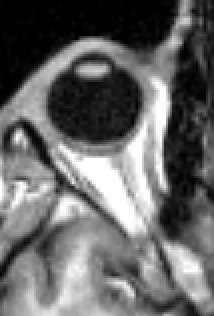 MRI scan showing lateral and medial rectus muscle. The extraocular muscles are the six muscles that control movement of the eye and one muscle that controls eyelid elevation (levator palpebrae). The actions of the six muscles responsible for eye movement depend on the position of the eye at the time of muscle contraction. Extraocular muscles are shown in this image of the left eye (lateral view). Click on the structures for more information. Since only a small part of the eye called the fovea provides sharp vision, the eye must move to follow a target. Eye movements must be precise and fast. This is seen in scenarios like reading, where the reader must shift gaze constantly. Although under voluntary control, most eye movement is accomplished without conscious effort. Precisely how the integration between voluntary and involuntary control of the eye occurs is a subject of continuing research. It is known, however, that the vestibulo-ocular reflex plays an important role in the involuntary movement of the eye. The extraocular muscles are supplied mainly by branches of the ophthalmic artery. This is done either directly or indirectly, as in the lateral rectus muscle, via the lacrimal artery, a main branch of the ophthalmic artery. Additional branches of the ophthalmic artery include the ciliary arteries, which branch into the anterior ciliary arteries. Each rectus muscle receives blood from two anterior ciliary arteries, except for the lateral rectus muscle, which receives blood from only one. The exact number and arrangement of these cilary arteries may vary. Branches of the infraorbital artery supply the inferior rectus and inferior oblique muscles. Below is a table of each of the extraocular muscles and their innervation, origins and insertions, and actions. Note that the muscles may have minor actions in neutral, adduction, or abduction, but the primary action is shown in bold. 3. Rectii act according to their names whereas Obliques act opposite to their names. The nuclei or bodies of these nerves are found in the brain stem. 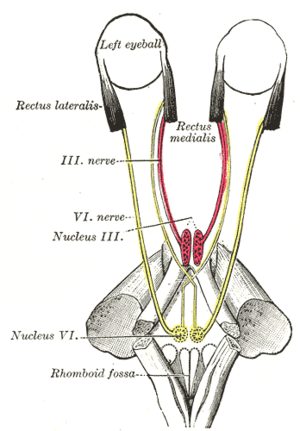 The nuclei of the abducens and oculomotor nerves are connected. This is important in coordinating motion of the lateral rectus in one eye and the medial action on the other. In one eye, in two antagonistic muscles, like the lateral and medial recti, contraction of one leads to inhibition of the other. Muscles shows small degrees of activity even when resting, keeping the muscles taut. This "tonic" activity is brought on by discharges of the motor nerve to the muscle. Four of the extraocular muscles have their origin in the back of the orbit in a fibrous ring called the annulus of Zinn: the four rectus muscles. The four rectus muscles attach directly to the front half of the eye (anterior to the eye's equator), and are named after their straight paths. Note that medial and lateral are relative terms. Medial indicates near the midline, and lateral describes a position away from the midline. Thus, the medial rectus is the muscle closest to the nose. The superior and inferior recti do not pull straight back on the eye, because both muscles also pull slightly medially. This posterior medial angle causes the eye to roll with contraction of either the superior rectus or inferior rectus muscles. The extent of rolling in the recti is less than the oblique, and opposite from it. The superior oblique muscle originates at the back of the orbit (a little closer to the medial rectus, though medial to it, getting rounder as it courses forward to a rigid, cartilaginous pulley, called the trochlea, on the upper, nasal wall of the orbit. The muscle becomes tendinous about 10mm before it passes through the pulley, turning sharply across the orbit, and inserts on the lateral, posterior part of the globe. Thus, the superior oblique travels posteriorly for the last part of its path, going over the top of the eye. Due to its unique path, the superior oblique, when activated, pulls the eye downward and laterally. The last muscle is the inferior oblique, which originates at the lower front of the nasal orbital wall, and passes under the LR to insert on the lateral, posterior part of the globe. Thus, the inferior oblique pulls the eye upward and laterally . The movements of the extraocular muscles take place under the influence of a system of extraocular muscle pulleys, soft tissue pulleys in the orbit. The extraocular muscle pulley system is fundamental to the movement of the eye muscles, in particular also to ensure conformity to Listing's law. Certain diseases of the pulleys (heterotopy, instability, and hindrance of the pulleys) cause particular patterns of incomitant strabismus. Defective pulley functions can be improved by surgical interventions. The extraocular muscles develop along with Tenon's capsule (part of the ligaments) and the fatty tissue of the eye socket (orbit). There are three centers of growth that are important in the development of the eye, and each is associated with a nerve. Hence the subsequent nerve supply (innervation) of the eye muscles is from three cranial nerves. The development of the extraocular muscles is dependent on the normal development of the eye socket, while the formation of the ligament is fully independent. Intermediate directions are controlled by simultaneous actions of multiple muscles. When one shifts the gaze horizontally, one eye will move laterally (toward the side) and the other will move medially (toward the midline). This may be neurally coordinated by the central nervous system, to make the eyes move together and almost involuntarily. This is a key factor in the study of strabismus, namely, the inability of the eyes to be directed to one point. There are two main kinds of movement: conjugate movement (the eyes move in the same direction) and disjunctive (opposite directions). The former is typical when shifting gaze right or left, the latter is convergence of the two eyes on a near object. Disjunction can be performed voluntarily, but is usually triggered by the nearness of the target object. A "see-saw" movement, namely, one eye looking up and the other down, is possible, but not voluntarily; this effect is brought on by putting a prism in front of one eye, so the relevant image is apparently displaced. To avoid double vision from non-corresponding points, the eye with the prism must move up or down, following the image passing through the prism. Likewise conjugate torsion (rolling) on the anteroposterior axis (from the front to the back) can occur naturally, such as when one tips one's head to one shoulder; the torsion, in the opposite direction, keeps the image vertical. The muscles show little inertia - a shutdown of one muscle is not due to checking of the antagonist, so the motion is not ballistic. The initial clinical examination of the extraoccular eye muscles is done by examining the movement of the globe of the eye through the six cardinal eye movements. When the eye is turned in (nasally) and horizontally, the function of the medial rectus muscle is being tested. When it is turned out (temporally) and horizontally, the function of the lateral rectus muscle is tested. When turning the eye down and out, the inferior rectus is contracting. Turning the eye up and out relies on the superior rectus. Paradoxically, turning the eye up and in uses the inferior oblique muscle, and turning it down and in uses the superior oblique. All of these six movements can be tested by drawing a large "H" in the air with a finger or other object in front of a patient's face and having them follow the tip of the finger or object with their eyes without moving their head. Having them focus on the object as it is moved in toward their face in the midline will test convergence, or the eyes' ability to turn inward simultaneously to focus on a near object. View of the orbit from the front, with nerves and extraocular muscles. ↑ Yanoff, Myron; Duker, Jay S. (2008). Ophthalmology (3rd ed.). Edinburgh: Mosby. p. 1303. ISBN 978-0323057516. ↑ Carpenter, Roger H.S. (1988). Movements of the eyes (2nd ed., rev. and enl. ed.). London: Pion. ISBN 0-85086-109-8. ↑ Westheimer, G; McKee, SP (July 1975). "Visual acuity in the presence of retinal-image motion.". Journal of the Optical Society of America. 65 (7): 847–50. doi:10.1364/josa.65.000847. PMID 1142031. ↑ Joseph L. Demer (April 2002). "The Orbital Pulley System: A Revolution in Concepts of Orbital Anatomy". Annals of the New York Academy of Sciences. Neurobiology of eye movements: from molecules to behavior. 956: 17–32. doi:10.1111/j.1749-6632.2002.tb02805.x. ↑ Demer JL (2004). "Pivotal Role of Orbital Connective Tissues in Binocular Alignment and Strabismus". Investigative Ophthalmology and Visual Science (45): 729–738. Eldra Pearl Solomon; Richard R. Schmidt; Peter James Adragna (1990). Human anatomy & physiology. Saunders College Publishing. ISBN 978-0-03-011914-9.